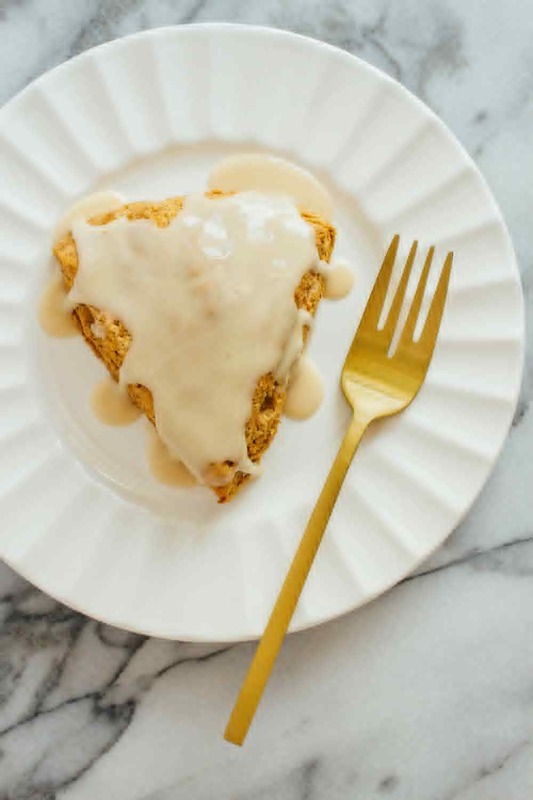 It’s the first day of fall and pumpkin scones are the perfect way to bring in the new season! Filled with pumpkin puree and warm spices, they turned out amazingly well and exceeded my expectations. They are perfectly crusted on the outside and tender on the inside. The flavor is just right, not too sweet with a perfect balance of spices. The glaze takes them over the top making them irresistible! With a minimal ingredient list, they come together easily and you will be enjoying the flavors of fall in no time. Let’s bring in the fall and enjoy the season’s flavors! After googling a bit, I decided to go ahead and adapt this pumpkin scone recipe from the Persimmon Ricotta Scones in the archives (which was a recipe I veganised from Sprouted Kitchen). Using that as a templet, I substituted the ricotta for the pumpkin puree and changed up the spices. This time around I decided to shape the dough into a circle, instead of a square, and cut the dough making 6 scones, instead of 9. With these minor adjustments, I couldn’t be happier with the final result. They are about as perfect as a pumpkin scone can be! Once you’ve mixed the dry ingredients together, add the coconut oil to the flour and mix well until flour becomes lumpy. The lumps should about the size of a pea, but it doesn’t have to be perfect. If you have a few larger lumps, it’s ok. Next, add the pumpkin puree and non-dairy milk, mix well. Using your hands, mold the dough into a ball, place on a lightly floured work space. Flatten the dough with the palms of your hands and fingers creating a circle, about 1 inch thick. Cut into 6 or 8 slices. Place scones on a baking sheet lined with parchment paper, a silpat, or lightly greased with oil and bake. Finally, add the glaze as seen above and let set until it hardens as shown below. FYI: What I learned about the frosting, is that it really does need to be made first. This will give it plenty of time to set and thicken up. So please, be sure to make your glaze first. It should be thick. I didn’t let my frosting set as long as I should have, which is why there was overflow and wasn’t thick enough to stay. I ended up using a spoon to scoop up the overflow, placing it back on top of each scone. But, if you’re going for perfection, make sure you give the glaze time to set before adding it to each scone. You may even let the scones cool down all the way or refrigerate them before topping. Warm scones will warm the glaze making it runny. All in all, no matter if the glaze is runny or firm, it’s absolutely delicious and completes the scones perfectly! 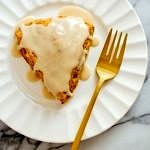 Bring in the fall season with these perfectly spiced pumpkin scones! These are at their best served fresh from the oven. In a small/medium bowl, add the powdered sugar, maple syrup and non-dairy milk, mix well and set aside. Glaze should be thick. Preheat oven to 425 degrees F. Line a baking sheet with parchment paper, a silpat, or lightly grease with oil. In a medium size bowl, mix the flour, baking powder, sugar, pumpkin spice and salt, blend well. Add the hardened oil, and using either a pastry blender or mixing spoon, mix well. Doesn’t have to be perfect. Add the pumpkin puree and non-dairy milk to the mixture, stir to form a dough. Using your hands, knead the dough into an even ball. Transfer the dough to a lightly floured surface. Lightly flour the top of the dough and pat into a 8 – 9 inch circle, 1 inch high. Using a knife, gently divide the dough into 6 – 8 slices. Place the scones on the prepared baking sheet. Bake for about 15-18 minutes until lightly golden along the edges. Let cool a bit before transferring to a cooling rack. Once cooled, place a spoonful right in the middle of each scone and use the back of the spoon to spread, or drizzle the glaze in a zig zag across the top of each scone. Let the glaze set. Store leftovers in airtight container, either on the counter or in the refrigerator, and eat within a couple of days. Be sure to make the glaze first so it has time to set and thicken as explained above. If using vanilla extract, use 1 teaspoon and add with the pumpkin puree and non-dairy milk. A note on the flours. Feel free to change-up the flour content…for example part unbleached all-purpose flour, all whole wheat pastry flour, spelt & whole wheat pastry flour, all gluten-free all-purpose flour, etc…it should turn out just as well. If you don’t have pumpkin pie spice on hand, try using 1 teaspoon cinnamon, along with 1/2 teaspoon ginger and 1/2 teaspoon nutmeg. Thank you Silk for sponsoring this post!